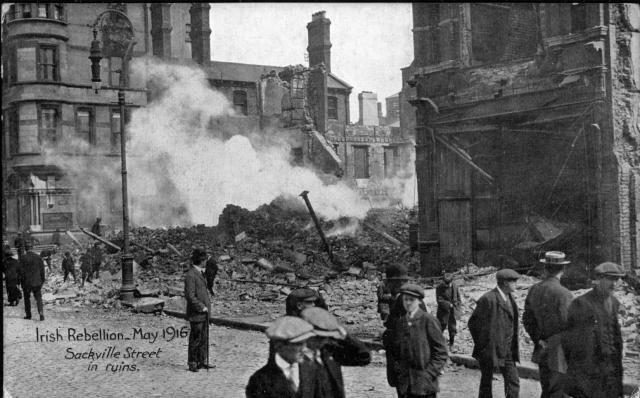 Dublin’s smoking ruins in May 1916. Image from the blog Come Here to Me. Smoke still rose from the ruins in Dublin city centre at the start of May 1916, including from those of the Grand Cinema, but the weather was about to quench the remaining embers. “The remark of the elderly Dublin citizen who, gazing out of the window on Saturday morning, exclaimed: ‘There has been insurrection, famine, and fire; now we’re going to have a flood,’ were more or less justified by the state of the weather,” observed the Ulster Herald of the period of 6-8 May. “From the early hours of Friday morning until Sunday, Dublin has been under a never-ceasing deluge of rain, and even the most curiosity stricken of those who are themselves within its borders are deterred from wandering forth on visits of inspection amongst the ruins” (“Rising in Dublin”). A photograph of the Picture House, Sackville/O’Connell Street taken during the week of 8-13 May. Image from RTÉ Archives on Twitter. Despite the fact that the city seemed to be under attack from the four horsemen of the apocalypse, some normality was returning by Monday, 8 May. 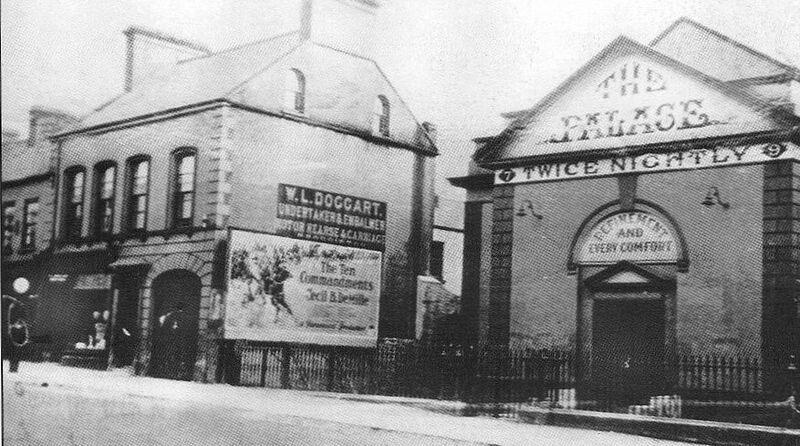 “Two cinema houses have re-opened in O’Connell street up to 6.30 each evening,” the same source reported, “and one of them displays a large poster announcing ‘All Easter Week: ‘The Christian.’”One of the earliest surviving photographs of a Dublin picture house shows that this was the Picture House at 51 Lower Sackville/O’Connell Street, which was remarkably unscathed given that it faced the totally destroyed Grand. 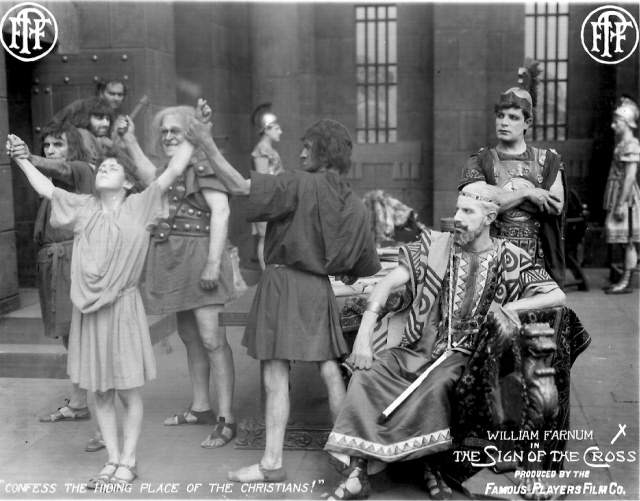 Most of the people in the photograph are not interested in The Christian, however, but are – in the Ulster Herald’s terms – stricken by curiosity to see the ruins. 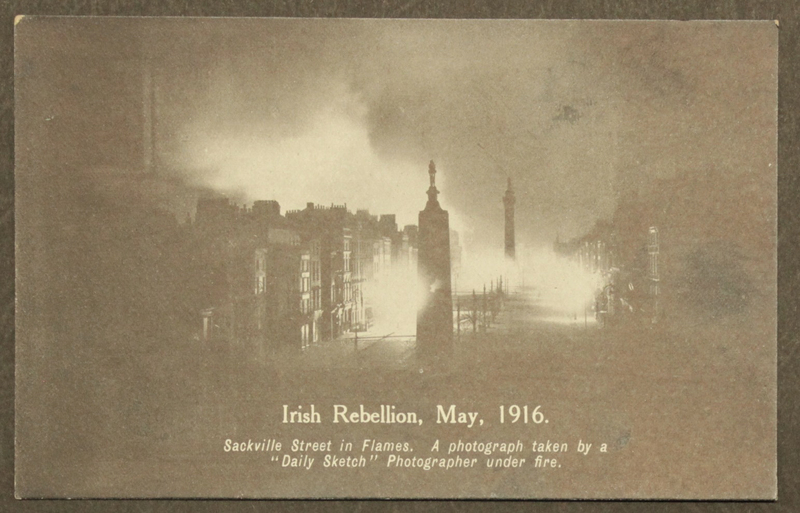 A photograph of Sackville/O’Connell Street in flames. Image from Letters of 1916. The Rising itself struck some observers as inherently cinematic. “For spectacular purposes nothing I have seen compares with the bombardment late yesterday afternoon of the Irish Republican flag on the cupola of the building nearly a mile from the hotel,” a Lloyd’s News Service journalist reported from his/her hotel room. “Fully fifty shells burst around the cupola before the flag fluttered to the ground. 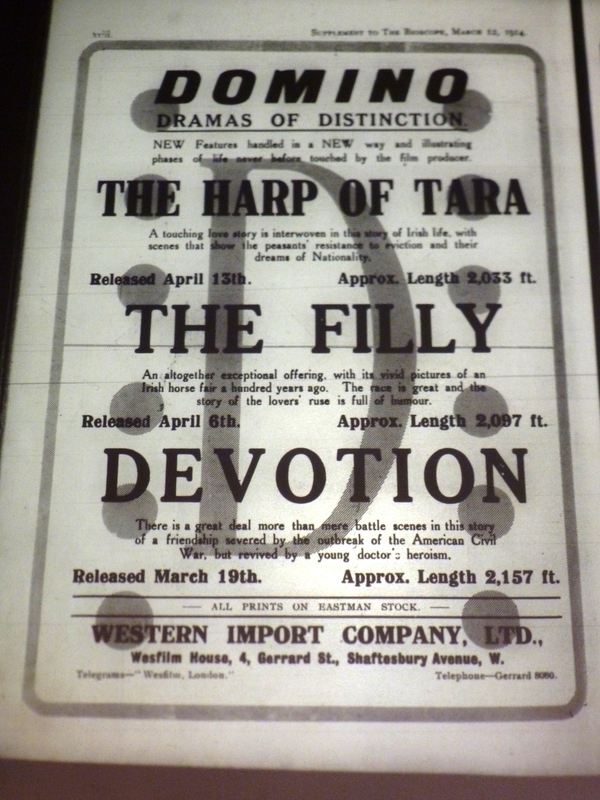 A cinema picture of this side-show would have been worth thousands” (“Dublin Rebellion”). No cinematographer seems to have captured scenes of the Rising itself that might have satisfied the curiosity of those who could not get to Dublin’s city centre. This is disappointing but hardly surprising given the dangers from fire, bombardment and snipers. Nevertheless, several newsreel films were made of the aftermath of the Rising showing the city in ruins by Pathé News, Gaumont Graphic and Topical Budget. The Irish Independent’s London correspondent noted that “Dublin wreckage films” were being shown in London theatres and picture houses offering a “picture of gaping ruins far more appalling than the London public has been prepared for” and a heartbreaking sight for Dubliners in exile (“Our London Letter”). The programme at Dublin’s Carlton for the week of the 8-13 May included Topical Budget’s Dublin in Ruins. Dublin Evening Mail 9 May 1916: 2. 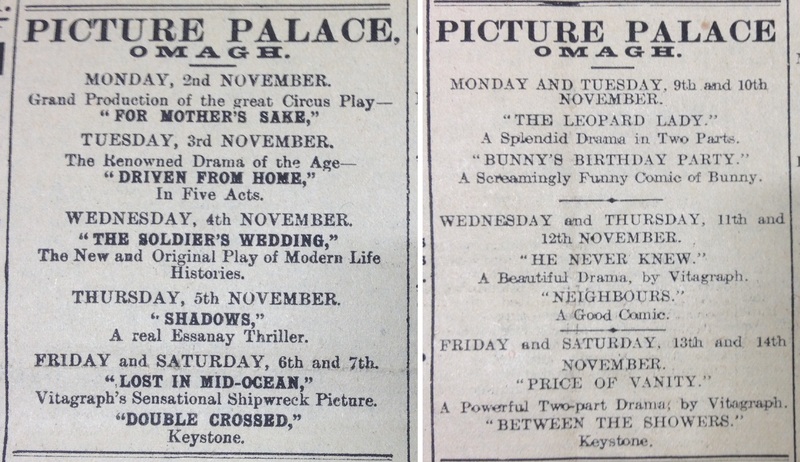 These films were also shown in Dublin itself once the picture houses reopened, which happened mostly in the week of 8-13 May. At this point, martial law restrictions allowed them to open only to 8pm. “The fabric of that historic building, the Rotunda, has happily escaped almost unscathed from the recent ordeal of fire,” the reviewer in the Irish Times noted on 9 May, “and an excellent programme of living pictures was yesterday presented to a succession of large audiences” (“Rotunda Pictures”). Further down Sackville/O’Connell Street and closer to the centre of the fighting during the Rising, the Carlton also opened on 8 May with “a superb programme, the Topical Budget included ‘Dublin Ruins,’ depicting the desolation of the Irish metropolis consequent upon the insurrection” (“Carlton Cinema”). 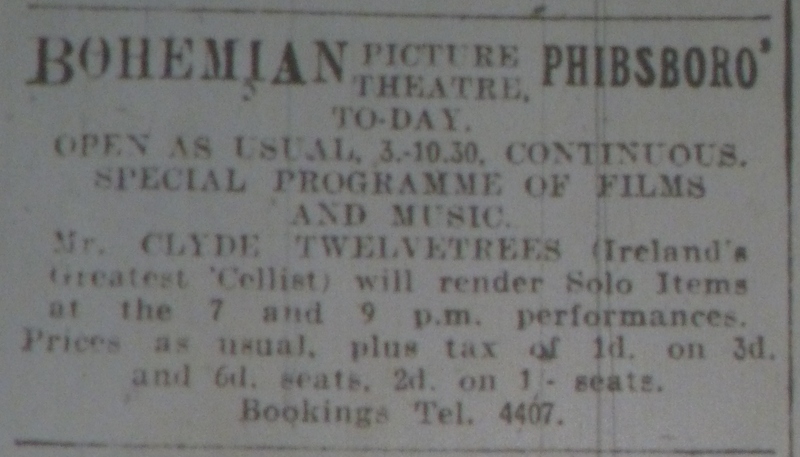 “Though the Pillar Picture House was well within the fire zone during the recent disturbances,” the Irish Times also noted, “the building has escaped with very minor injuries, and, despite the difficulties of transport, the management were able to re-open yesterday at noon with a very attractive programme” (“Pillar Picture House”). 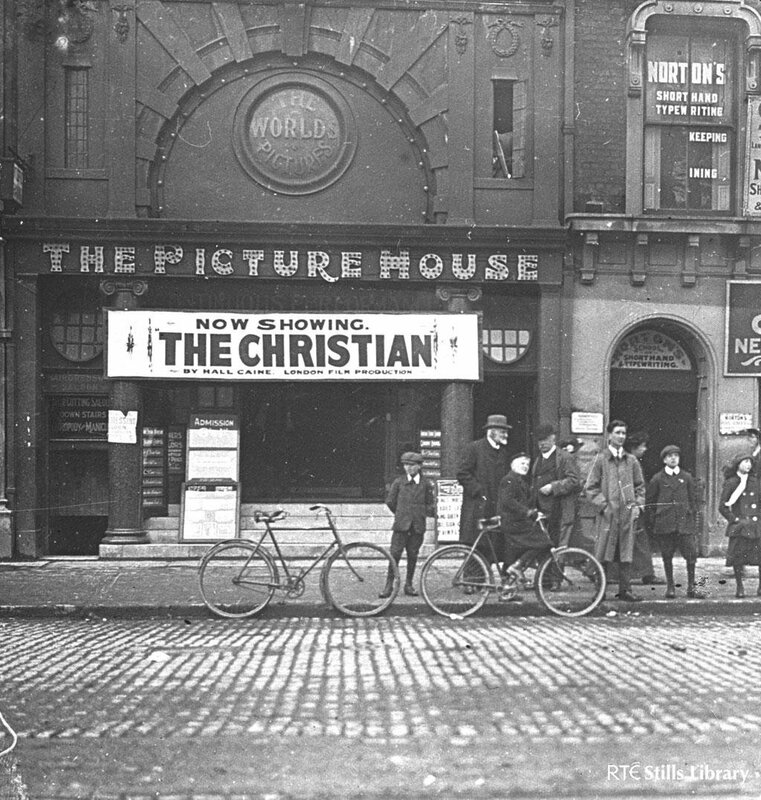 Although business at the Mary Street Picture House was “somewhat hampered by the dislocation of cross-Channel communication,” it offered a programme that included Chaplin’s A Film Johnnie (US: Keystone, 1914) and the Gaumont Graphic with all the latest topical features, and recent events in Dublin” (“Mary Street”). The Bohemian advertised The Dublin Rising and Ruins of the City with musical accompaniment by Clyde Twelvetrees. Dublin Evening Mail 12 May 1916: 2. 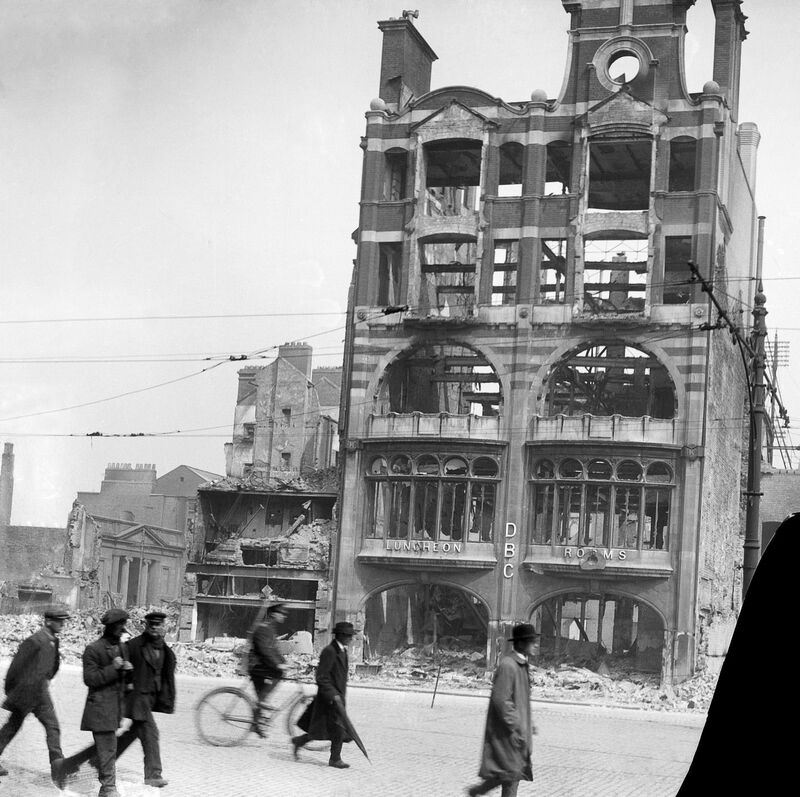 In the second half of that week (11-13 May), the Bohemian exhibited what appears to have been a longer film of the city’s ruins, Dublin Rising and Ruins of the City. Its prominence in advertising suggests that this was not just another newsreel item but something more substantial. The only surviving newsreel film of more than a few minutes is the Imperial War Museum’s (IWM’s) 14-minute Easter Rising, Dublin 1916. The IWM has little information on the origins of the film, and its intertitles are missing. 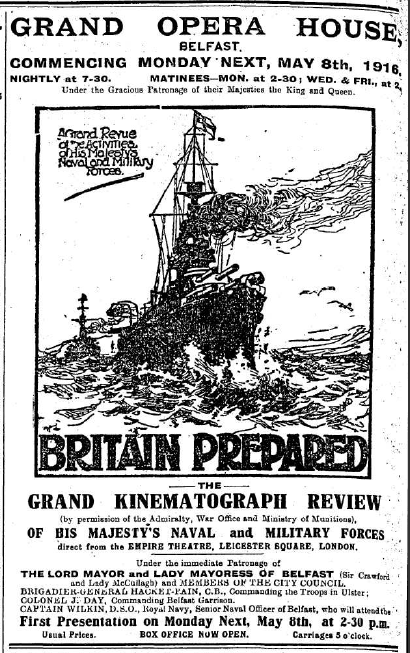 Ad for the exhibition at Belfast’s Panopticon of Dublin Revolt, a long film of the aftermath of the Rising; the similarly titled film at the Imperial is actually the Topical Budget. Belfast News-Letter 8 May 1916: 4. 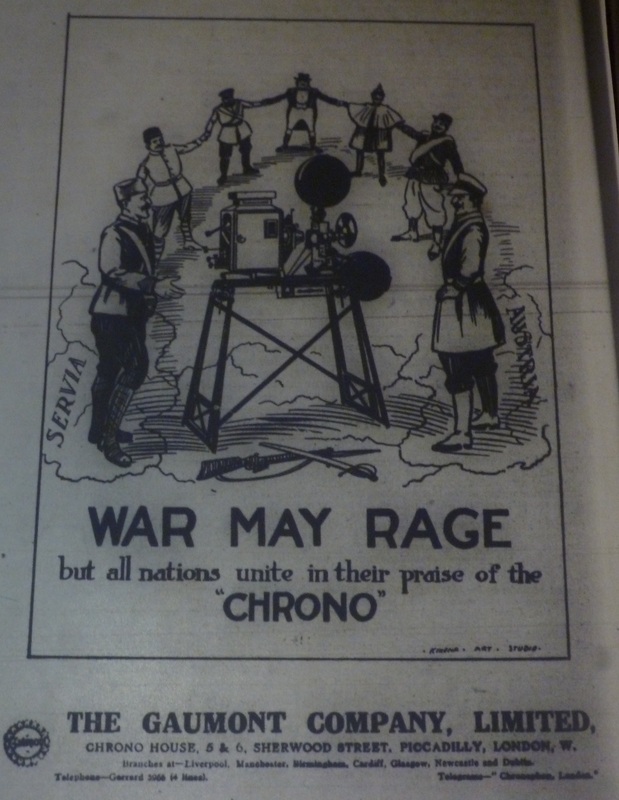 However, under the title Dublin Revolt, the IWM film was shown at Belfast’s Panopticon for the week of 8-13 May, and in other Belfast cinemas for the latter half of that week. 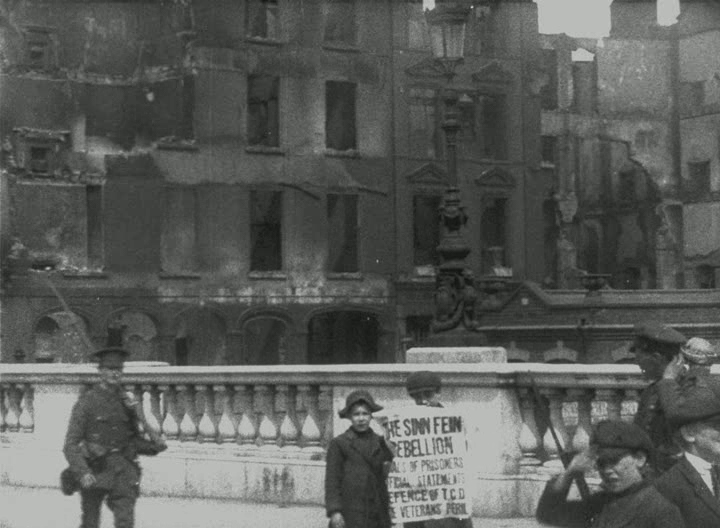 The film had intertitles, including “[‘T]he Sinn Feiners marching into Dublin,’ ‘The Parade of the National Volunteers and Sinn Feiners,’ ‘Liberty Hall,’ ‘British Picket at the Custom House,’ ‘Wounded Sinn Feiners in Hospital,’ ‘British Armoured Car’” (“Panopticon,” 9 May). The Panopticon’s ad in the Belfast News-Letter claimed that the film was “Taken by Our Own Operator,” but it may have been shot by Norman Whitten of General Film Supply, Ireland’s most prominent maker of film topicals. Paddy, Irish correspondent of the trade journal Bioscope, reported that Whitten “was out very early with his camera, and secured practically 2,000 feet of exceptionally interesting views.” Given the chaos of the picture-house business in Dublin after the Rising and the international interest in events, he sold these to “Messrs. 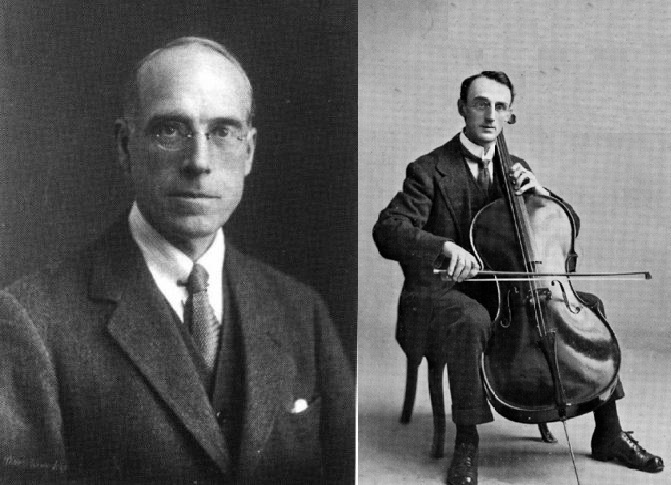 Jury’s Imperial Pictures, Limited, and Mr. Whitten crossed over to England with the negatives so as to make sure that they reached their destination” (Paddy, 18 May). The Bohemian may have secured a 1,000-foot cut of the GFS film (Condon). Framegrab from Easter Rising, Dublin 1916 (IWM 194) showing newsboys selling the Irish Times of 3 May 1916 against the backdrop of the ruins on Eden Quay. In Dublin, these films appear to have been designed to attract into the picture houses the people who were wandering the destroyed city centre fascinated by the ruins. Paddy reported that “people are not too keen on pictures just at the moment,” but were instead watching as “[o]dd walls of ruined buildings are being pulled down in Sackville Street […T]he streets are packed with people in dense masses, quite oblivious to the fact that some portion of the bricks and mortar may fall on them” (Paddy, 18 May). Dublin Evening Mail 10 May 1916: 2. Belfast News-Letter 6 May 1916: 8. 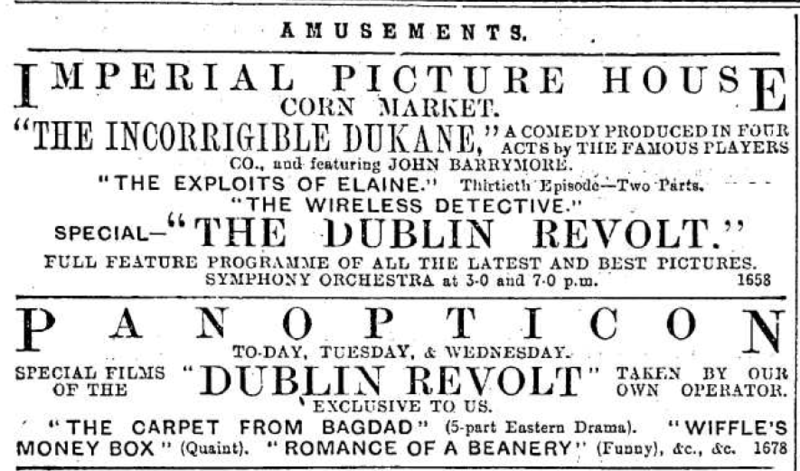 Although the second week in May brought Dublin Revolt to Belfast’s Panopticon, the lack of a train service between Dublin and Belfast until 3 May meant that manager-proprietor Fred Stewart could not show the films he had advertised for the first week (“Panopticon,” 2 May). As well as this, the cancellation of the planned visit by the D’Oly Carte Opera Company during the week of 15-20 May caused Belfast’s Opera House to retain the film Britain Prepared for a second week (“Grand Opera House”). Given the disruption and excitement generated by the Rising, other developments seem to have been taken in stride. These included the introduction of the Entertainment Tax and of Daylight Saving Time, and a government focus on cinema as the cause of juvenile crime. Irish newspapers widely reported Home Secretary Herbert Samuel’s statement in Westminster that one of the causes of the considerable rise in juvenile crime in provincial towns was “the character of some of the films shown at cinematograph theatres” (“Crime and the Cinema”). The Leitrim Observer took up the issue in its editorial at the end of May. “There can be no doubt that the cinema has abundantly established its claim as a cheap, popular, and harmless form of amusement and recreation, so far as the adults are concerned,” it argued. “Whether the ordinary cinematograph entertainment is good for young children is another matter” (“Children and Cinemas”). Although acknowledging that parents without childcare had to bring their children to the picture houses with them, the writer thought this a poor excuse if harm was actually being done to the young people. Article explaining rates of Entertainment Tax; Evening Telegraph 15 May 1916: 1. The much heralded Entertainment Tax came into force on 15 May 1916. A reporter for the Cork Examiner gave the matter considerable attention, interviewing theatre managers and analyzing who was paying most. The writer found picture-house managers relatively untroubled by the measure, arguing that if there was any effect at all, it would likely only be for the first week or so. The writer also pointed out that if there were any decreased attendance, it might in any case be attributed to good summer weather. Dublin’s Bohemian advertises new tax; Evening Telegraph 15 May 1916: 2. 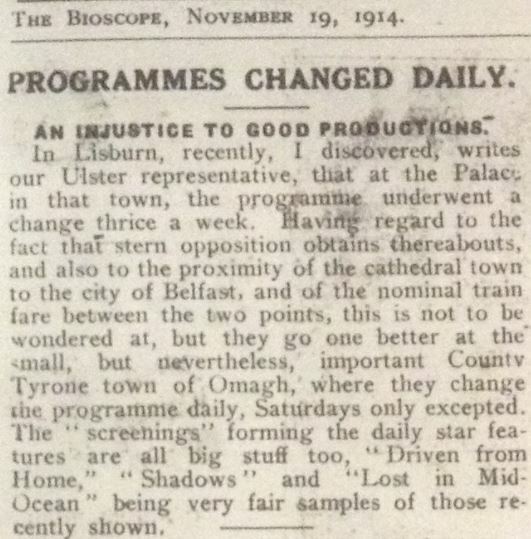 Examining the amount raised during the tax’s first week, the Belfast News-Letter found that the bulk of the receipts came from picture houses rather than theatres. Using figures from Liverpool, it estimated that £900 of the £1,600 tax collected in the city came from cinemas (“Entertainment Tax,” 24 May). The introduction of Daylight Saving Time on 21 May proved even less controversial in the Irish cinema trade. Among the Dublin theatre and picture house managers/proprietors interviewed by an Irish Independent reporter, manager Richard Bell of the Sackville Picture House and John J. Farrell, who owned several Dublin picture houses, expressed the view that the measure would not affect them in any way and that they saw no reason to change their hours of opening. Only Barney Armstrong of the Empire Theatre thought the regulation “would likely have the effect of slightly reducing the attendances during the summer months, especially at the first ‘house’” (“Daylight Saving Act”). For picture houses that opened from the early afternoon, this was less of an issue. By the end of May, life in the Dublin appeared to be returning to normal, albeit among the ruins of the city centre. Paddy noted that “[m]arital law in Dublin has been considerably modified, people now being allowed out until 12 o’clock. This means that one can visit a theatre or music hall in comfort and still be able to catch the last tram home.” Even if many picture houses were slower in settling down after the Rising, this was due to good weather, which “proved equally as strong an attraction as the spectacle of falling buildings” (Paddy, 25 May). “Bandon Notes.” Southern Star 20 May 1916: 5. 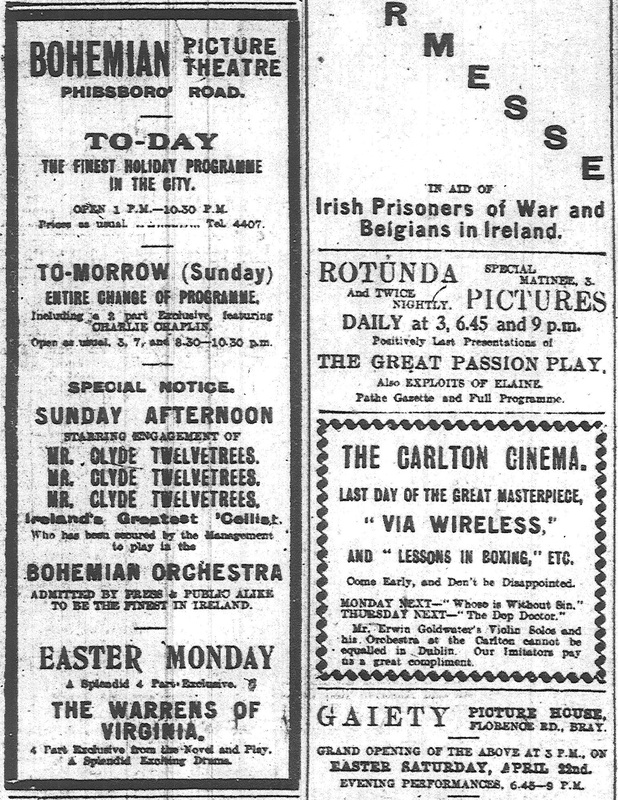 “The Carlton Cinema.” Irish Times 9 May 1916: 3. “Children and Cinemas.” Leitrim Observer 27 May 1916: 3. Condon, Denis. “‘Pictures in Abeyance’: Irish Cinema and the Aftermath of the 1916 Easter Rising.” Moving Worlds April 2016. “Crime and the Cinema.” Leitrim Observer 20 May 1916: 7. “Daylight Saving Act: Favourable Irish Recption.” Irish Independent 19 May 1916: 4. “The Dublin Rebellion.” Southern Star 6 May 1916: 2. 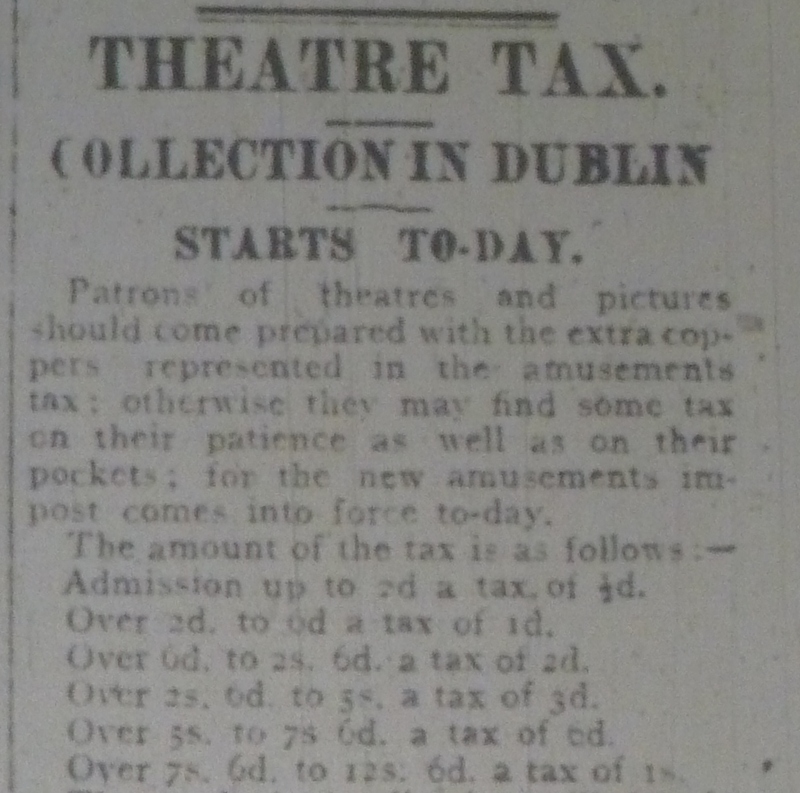 “Entertainment Tax Comes into Operation.” Cork Examiner 16 May 1916: 6. “The Entertainment Tax: £1,600 the First Week’s Yield in Liverpool.” Belfast News-Letter 24 May 1916: 4. “Grand Opera House: ‘Britain Prepared.’” Belfast News-Letter 16 May 1916: 2. “Mary Street Picture House.” Irish Times 9 May 1916: 3. 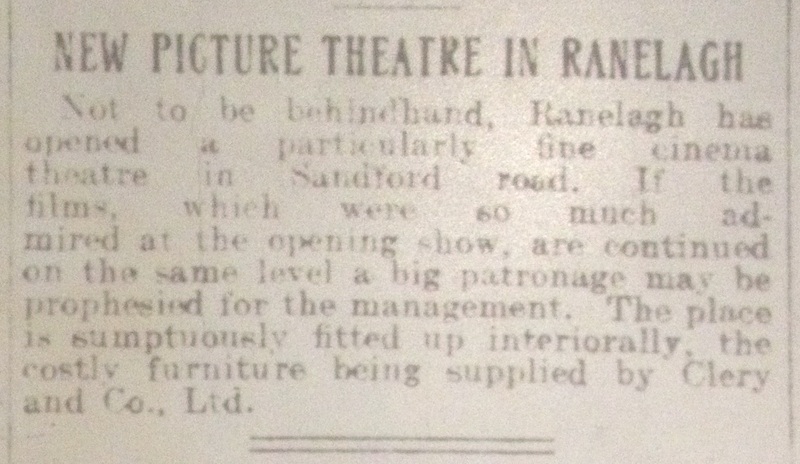 “National Picture Palace.” Westmeath Examiner 20 May 1916: 4. “Our London Letter: Dublin Wreckage Films.” Irish Independent 15 May 1916: 2. Paddy. “Pictures in Ireland.” Bioscope 18 May 1916: 845; 25 May 1916: 911. “The Panopticon.” Belfast News-Letter 2 May 1916: 2; 9 May 1916: 2. 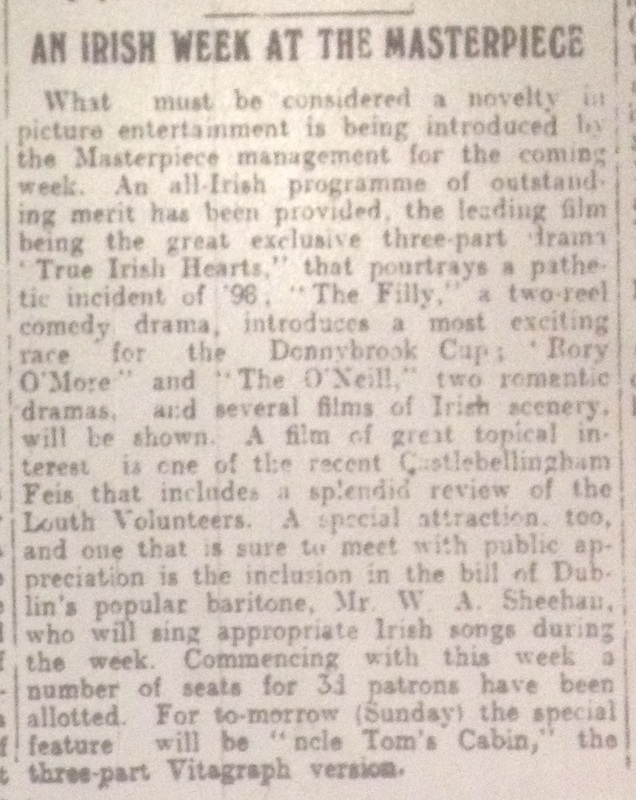 “The Pillar Picture House.” Irish Times 9 May 1916: 3. “The Rising in Dublin: Scenes in the Ruins.” Ulster Herald 13 May 1916: 3. “Rotunda Pictures.” Irish Times 9 May 1916: 3. 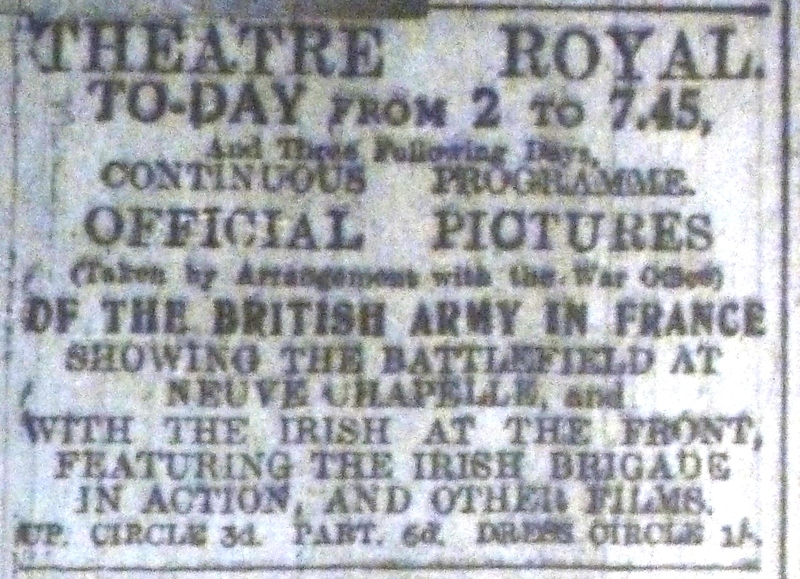 “Theatre Royal.” Irish Times 9 May 1916, p. 3.